I founded the non-for-profit organization The Fund to End the Deficit in 1993 and rallied citizens, under Public Law 87-58 (P.L. 87-58), to make voluntary contributions to retire the National Debt through 1999. As Executive Director of The Fund, I traveled across the Land giving out Susan Vaughn Clayton Liberty awards to recognize the voluntary initiatives of everyday citizens who love America and wanted to give something back to this great Country that has given so much to each of us. Susan Vaughn Clayton dies in 1960 and left $20 million to America, her "beloved Country," on the condition that it would only be used to retire America's National Debt. Representative Charles Bennett of Florida ushers Public Law 87.58 through both Houses of Congress in only 3 months time as all Congress agreed to "empower the people of America to participate in the great undertaking of retiring the National Debt." June 27, 1961, President Kenney signs Public Law 87-58 to create the Statute of Liberty that empowers all citizens to direct the Government only to use their contributions to retire the principal of the National Debt. Larry Villella, a 14 year old entrepreneur for Fargo, North Dakota donated $1,000. Lucile McConnell launched the Fund to End the Deficit, which contributed over $10,000 to Debt Retirement. Frank Mirizio's government class of Corona Del Sol High School in Tempe, Arizona raised and donated $16,000 by selling T-shirts for the Debt. Fifth graders of Oxford, Ohio held a bake sale and contributed $278.50 to Debt Retirement. Eskimo Pie Corporation donated over $72,000 to Debt Retirement by contributing 5 cents per box of Pies sold for only 1 month. 1001 Corporation, owner of La Prima and Via Cucina restaurants in Washington, DC, contributed $10,000 from sales of its "Deficit Reduction Special Sandwich." Operation Wipeout, a senior group in Alexandria, Minnesota, held an auction and donated $3,500 to Debt Retirement. Students from Metro Community College and Bellevue High School in Nebraska donated $172 and $300, respectively, to retire the Debt. Four fifth grade students from Pine Forest Elementary School in Little Rock, Arkansas (The Deficit Deductors), donated $390 from selling pickles to their teachers and classmates for 4 months. Students at City College of San Diego raffled off a laptop computer in Delete the Debt to donate $800 to Debt Retirement. Students at State University of New York held a Rock the Debt Concert and donated $270 to Debt Retirement. In one year, Fiscal Year 1994, citizens donated more than $20 million to debt retirement. Since 1993, citizens have voluntarily contributed $66,824,802.50 to debt retirement, with $7,694,091.70 donated in fiscal year (FY) 2012. The 2012 voluntary contribution amount is 7 times the average annual donation amount. Time to take a fresh look at voluntary citizen debt retirement contributions! The list goes on and on�.Now, I want to tell the story of the power of a positive healing vision and a willing heart to shape our future and redeem our beloved Country. The Good News is that we are empowered NOW to create the Future of Our Choice, thanks to one American citizen, Susan Vaughan Clayton; one Congressman from Florida, Charles Bennett; and one American President, John F. Kennedy. Together in 1961, they forged the original Partnership for America's Future and initiated Public Law (P.L.) 87-58, which empowers every American citizen today, regardless of age, to make voluntary contributions of money to the Country on the condition that these contributions are used only to retire the existing principal of the National Debt. This is an idea whose time has come: voluntary citizen contributions can and will shape the destiny of America! We are the heroes that we are looking for! What we cannot do alone, we can do together. The power is in the numbers and with over 313 million citizens in America, the small contributions of individuals do add up. [empowered to participate in the great undertaking of retiring America's National Debt] The contribution of one person, multiplied by the positive contributions of others, all acting in agreement, accumulates into serious change. 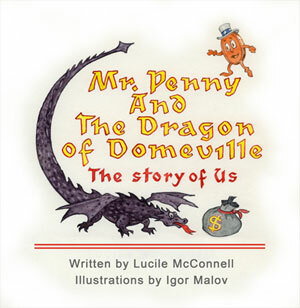 This is the change that Mr. Penny brings about in this inspiring and uplifting story of the power that one healing positive vision and one willing heart have to unite the little people into courageous action for the good of all. Mr. Penny and I invite you to get rollin', America! Welcome to the Future of Our Choice! "Get your pennies ON!" Mr. Penny.